Listen to Classie Ballou on "Hey Pardner" and "Classie's Whip"
Classie Ballou made his recording debut as the guitarist on Boozoo Chavis' first single, "Paper In My Shoe," the record that literally put zydeco music on the map. The story behind this kit-bashing of stylistic nuances is a rock 'n' roll moment that must be savored. Eddie Shuler, who'd decided to record Chavis for his Goldband label, hired Ballou's band to back him, naturally assuming that with the best R&B combo in the area, he couldn't go wrong. But, as Shuler classically concluded in John Broven's South To Louisiana, "I didn't know it, but Ballou's band had never heard of zydeco music, let alone played it. Ballou's boys just couldn't dig Boozoo's music and Boozoo didn't know they weren't with him!" After eight hours of utter frustration someone had the brilliant idea of fortifying Chavis with a little liquor and things finally began to take shape until suddenly, through the control room door, Shuler heard what he describes as "a collassal crash" in the middle of an otherwise decent take. When he opened the door, he relates, "There lay Boozoo. He had fallen off his stool but managed to keep his accordion in the air, not missing a note!" Months later, Shuler released the cut-crash and all--on a whim, and lo and behold, an entire genre was born. Boozoo aside, this strange clashing of musical sensibilities marked the beginning of a wild career for Classie's band the Tempo Kings, already renowned in Lake Charles for their storming version of Gatemouth Brown's "Okie Dokie Stomp." They proceeded to lay down some equally impressive originals for Excello and Goldband, blowing away listeners with their patented Creole/Afro/Latin rhythms on weird guitar instrumentals like "Crazy Mambo," "Confusion," and "Hey! Pardner!," and awesome swamp blues like "D-I-R-T-Y D-E-A-L" and "Dream Love." 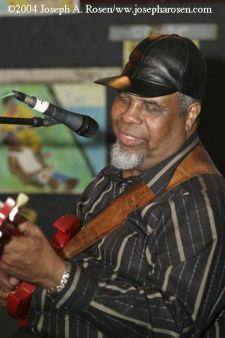 After giving Cookie Thierry (of Cookie & the Cupcakes) and Carol Fran their starts, Classie led the bands of Big Joe Turner and Rosco Gordon, playing guitar on Rosco's well known Vee-Jay hit "Just a Little Bit." Ballou's live shows are the kind of take no prisoners affairs where-unlike so many of his contemporaries--he's guaranteed to play 'em all, throwing in his amazing versions of "Jambalaya", "Mathilda," "Guitar Rhumbo," "Honky Tonk" and "Sweet Home Alabama." Classie's family band features son Cedric (bass), grandson Cedryl (drums, accordion) and daughter CeChaun (sax, guitar and drums), all of whom have been taught to play by the master, resulting in an old school musical approach crossed with a youthful exuberance that belies the era they grew up in. Thus, when they tackle one of Classie's old numbers, it sounds exactly like the original record; likewise, if you hear 'em do "Tutti Frutti" it'll be injected with every subtle nuance that's been lost by everyone else in the last forty years. Simply put, Ballou and his wrecking crew are one of the best rock 'n' roll bands you'll EVER see, end of the story.